VATICAN CITY: Pope Benedict XVI urged an end to “religious hypocrisy” and “rivalry” in the Catholic Church as he donned his papal mitre for the last time at an emotional mass in St Peter's Basilica on Wednesday. Wearing the purple robes of Lent -- a period of penitence for Christians before Easter -- the pontiff was conveyed through the basilica's vast nave on a mobile platform because of his growing infirmity. Benedict urged the faithful to be sincere in their faith in his final mass as leader of the world's 1.2 billion Catholics before he becomes only the second pontiff to resign voluntarily in the Church's 2,000 years. He condemned “religious hypocrisy” and called for an end to divisions, saying that “the face of the Church is sometimes marred by sins against the unity of the Church and divisions in the clergy”, an apparent reference to the paedophilia or Vatileaks scandals plaguing the institution. The pope also called for an end to “individualism and rivalry”. Earlier Wednesday, the frail pontiff was greeted by a standing ovation, applause and chants of “Benedetto” at his weekly audience with thousands of believers in a Vatican auditorium. A prominent banner read: “Thank You, Holiness”. 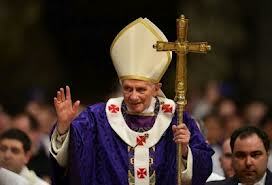 Benedict told the crowd he had taken his momentous decision “for the good of the Church”. “Keep praying for me, for the Church and for the future pope,” he said, his voice full of emotion. Wearing his workaday white cassock and skullcap, the pontiff said he could feel the faithful's love “almost physically in these difficult days”. The Vatican announced that cardinal electors -- the princes of the Church -- will meet on or in the days after March 15 to choose Benedict's successor. The secret conclave held in the Sistine Chapel under Michelangelo's famed ceiling frescoes -- deliberations that normally last a few days -- should produce a new pope in time for Easter. Many ordinary Catholics have said they would like the new pope to be more in tune with the times after the traditionalist reigns of Benedict and his long-time predecessor John Paul II. “I want someone who is youthful and with a youthful spirit who can be more flexible,” said Ieva Tamosaityte, 25, a Lithuanian musician in the congregation at the pope's last mass. “I would like future popes to retire when they get old too,” she said, as staff in the basilica distributed photos of the outgoing pope. Rumours have begun flying over front-runners to succeed Benedict, but no clear candidate has emerged yet and the decision will be up to the 117 elector cardinals. While some hope that Africa or Asia could yield the next pontiff, others have tipped high-flying European or north American cardinals.